It’s that time of year again! My favorite time of year. The holidays! One thing though about the holidays that I have a love hate relationship with is Christmas shopping. It is fun to pick out presents for everyone but at the same time it is also very stressful no matter how well you plan. This year though to help ease the holiday stress I have decided to start my holiday shopping early and the first present for my daughter has officially arrived in the mail. It has made me even more excited for the upcoming holidays and events. This is my daughter’s first Christmas present. So cute right? I do have a confession though she has already seen it! I got the box in the mail and I was expecting it to be something else so I opened it with my daughter right next to me peeking her little head in to see what we got. As soon as she saw it she gasped and reached in and hugged her new puppy, box and all. So I now can say that this has been approved by my daughter even though it is now hidden away until Christmas morning! 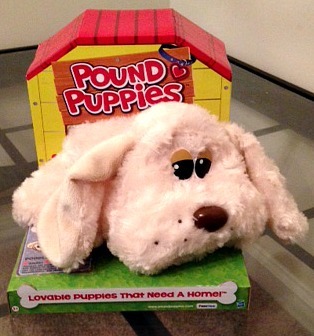 The Pound Puppies are one of the toys that was represented at the TTPM Holiday Showcase. Check out this toy and others from the showcase at our TTPM Most Wanted Holiday Toys blog post. The Pound Puppies are not just stuffed animals. They are stuffed animals that your child can adopt. 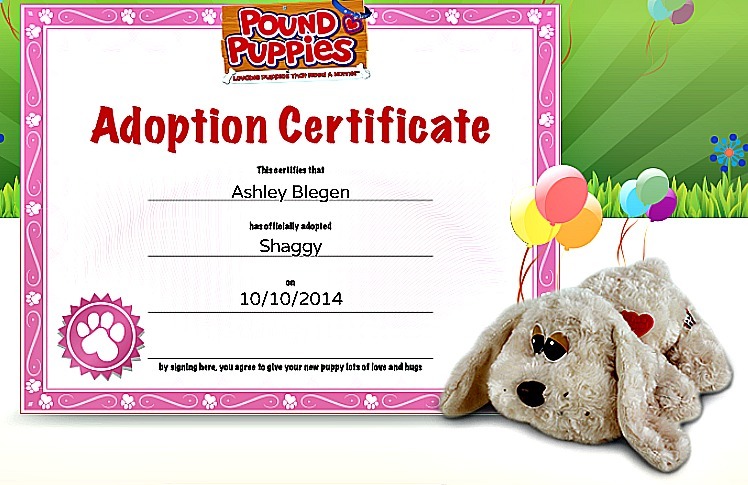 Once you have bought a puppy, which by the way retails at only $19.99 (or as low as $5.99 if you choose one of the smaller puppies, I got the 12″ puppy) a puppy, you then can go to the Pound Puppies website and your child can name their puppy and fill out their adoption certificate to make it official that they are the owners of that puppy and you print it out right at home. Here is a picture of an example certificate that I filled out online. I will probably wait until my daughter first gets the dog as a present and then is old enough to name the puppy herself to actually print a real certificate out for her and her dog. The puppy I chose was the poodle and it’s fur is really soft so it is perfect to snuggle with. Another great thing about these puppies is that it is like you are giving your child their own puppy but you won’t have to end up cleaning up after it! That is a big plus for my husband and I! The puppies also all come with their own breed specific fact card (you can choose between a Beagle, Labrador, Bulldog or a Poodle) and a heart shaped dog tag that your child can write their puppies name on. They will be available this fall so don’t miss out on adding one of these cute Pound Puppies to your family this holiday season!